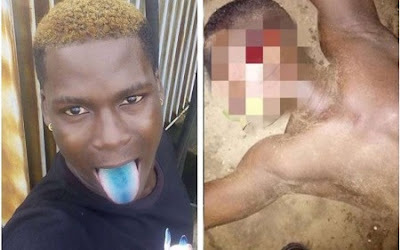 The alleged leader of a cult, Olamid Oloruntobi, was shot during a shootout by agents of the Lagos State Police Command. The 31-year-old, who allegedly terrorized Cele Nizer residents in the Ishashi area of Lagos state, was shot dead around 8.40pm on Tuesday. Lagos public relations officer CSP Chike Oti said the command had been alerted that members of the Aiye cult were terrorizing the area. He explained that the ruffians, when they saw the agents, opened fire on them. Oti said, "The later notorious cult member, who was the leader of the dreaded Aiye Brotherhood, met his Waterloo in Durosooto Street, Cele Nizer, New Mebamu, Ishashi, at around 8:40 pm on Tuesday, when police were alerted to the group led by the deceased, had begun to terrorize the inhabitants.